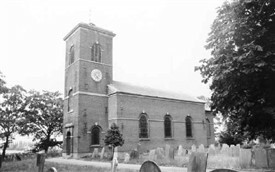 "Kinoulton is a long straggling village of somewhat mean appearance, with a church (St.Luke) built in 1793 to replace one which stood on Kinoulton Wolds, near the Fosse Way. "Of ths old church the outline can still be traced. "Tradition has it that the Archbishop of York once had a residence here, and it may be due to this that the vicars had, until 1858, the right of proving the wills of his parishoners. "On the Colston Bassett side of Kinoulton was was the village of Newbold, of which all trace has been lost".